It's Friday night and I'm back once again with the Stamping 411 weekly Sketch Challenge. I'm happy to report that even though I had a "You've GOT to be kidding me!" 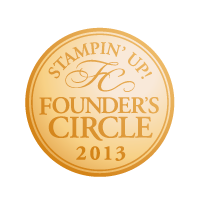 moment when I first saw this sketch - all is still well in the ol' stampin' studio. I know. That's quite the sketch, now isn't it? Yes, I KNOW it's busy - but hey, did you see that sketch?!! And truthfully - I really do like how it turned out! 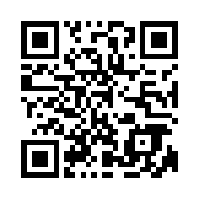 So, here's what I did - don't worry, it's easier than you may think. The card base layer is Crumb Cake cut at 4 1/4" x 11" and folded in half to make an A2 size card 4 1/4" x 5 1/2". I sponged the edges with Always Artichoke ink. The next layer is Cherry Cobbler (LOVE me some Cherry Cobbler!) cut at 4" x 5 1/4" and sponged with Cherry Cobbler ink. Then I cut four strips of 1 1/8" x 3 3/4" Deck the Halls Designer Series Paper and sponged the edges in Always Artichoke ink. The next layer is a piece of Crumb Cake cardstock cut out with my Big Shot and the Top Note Die. 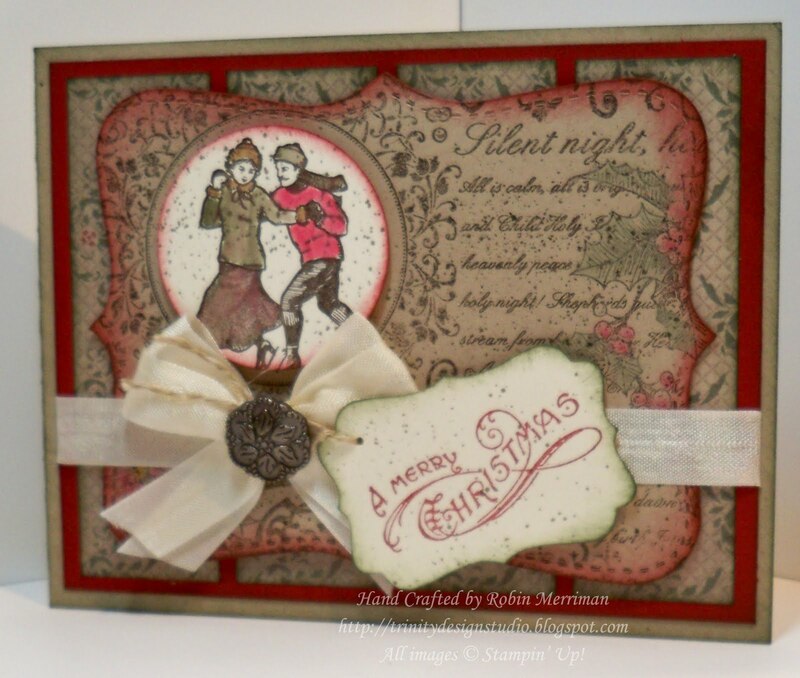 I stamped it with the Christmas Collage background stamp in Early Espresso ink and sponged the edges in Cherry Cobbler. I colored in the holly and berries with my Stampin' Pastels to add a little more color. Now, for the focal point. I colored in my image this time with my Aqua Painters and ink from the lids of my ink pads. 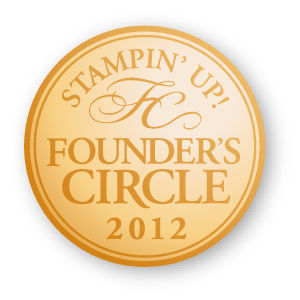 It was then punched out using the 1 3/4" Circle punch, sponged with Cherry Cobbler and mounted with 2 Stampin' Dimensionals onto the Top Note piece. Next, I mounted the Top Note piece to the DSP and Cherry Cobbler pieces and added a strip of Very Vanilla Seam Binding across it all. The bow was created by layering two pieces of Very Vanilla Seam Binding together, tying my bow and separating the pieces. I opened up the prongs of the Antique Brad and wrapped it around the middle of the bow and attached the whole thing with Mini Glue Dots to the card front. Ok, how about that tag! 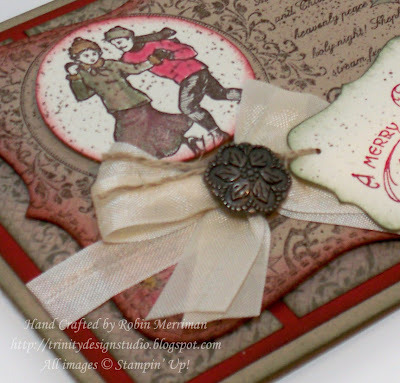 I inked up the greeting from the Bells and Boughs stamp set with Cherry Cobbler ink and stamped it on a scrap of Very Vanilla cardstock. It's punched out with the Decorative Label Punch, sponged with Always Artichoke ink and speckled with the Color Spritzer. I punched the small hole with my 1/16" Handheld punch and tied it to the bow/button with a piece of Linen Thread. It's secured to the card front with a single Dimensional behind it. 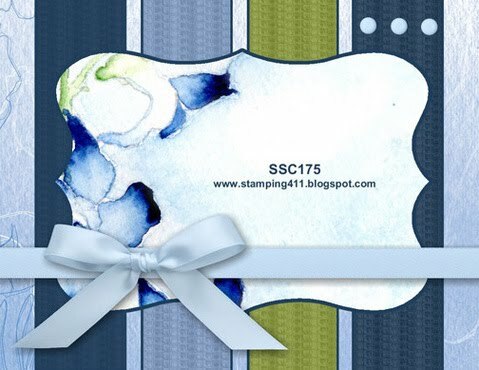 Be sure to check out all the other operators creations by visiting the Stamping 411 blog this weekend. I know they will have some wonderful projects to share with you! I hope you all enjoy your weekend. We are finally going on our annual apple picking trip on Saturday. Heading up to Marker-Miller Orchards in Winchester, VA. I LOVE going to this orchard. Not only do they have terrific apples, but they make homemade Apple Cider donuts that are truly one of the most wonderful things I've ever put in my mouth! I love getting them all warm and cinnamon-sugary right out of the bakery. We get a bag and some apple cider and go sit out on the big wrap around porch in a wooden rocking chair and eat till our hearts content! The view this time of year is glorious with all the fall colors and gorgeous apple trees spread out around us there. I'll be sure to take some photos tomorrow and share them with you next week. Tomorrow evening, we'll be home baking apple pies and making homemade applesauce. The pies we do each year, but the applesauce is new, inspired by my friend Pam at SU! corporate. We'll see how it turns out....... I'll let you know! Sunday is another busy day - we have our annual Trunk or Treat at our church starting late afternoon. All the families participating decorate the trunk or hatchback of their cars, dress up in fun costumes and hand out candy to all who come by for treats. It's such a fun time of community and fellowship, not scary at all, but great for every family! I for one, am looking forward to the candy! You know me and chocolate! OMG!!! Too flippin' funny!!! This "queen of the sponge" loves your card!!! I don't think it's busy at all....it's wonderful!!!! You know, I haven't purchased that background stamp yet. Hmmmmmmm!!! P.S. I'll send you my card if you send me some cider donuts. They're not yummy out here like they are on the east coast! Donuts! Did somebody say Donuts? Not fair when I'm on Weight Watchers! This card is fantabulous. I've got both these sets and will be trying this beauty our today!! Thanks for the inspiration Robin. 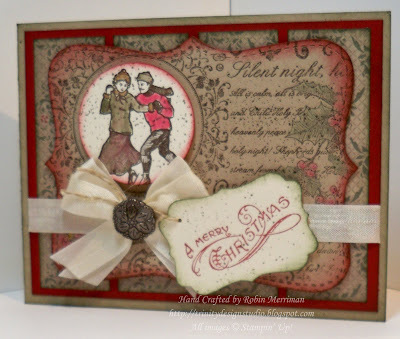 Another stunning creation Robin, I don't know how you keep doing it card after card...you do vintage the vintage style SO well!! Gorgeous!! I LOVE this card, but I am a busy card kind of girl! This is a good busy, with lots of eye candy (the ribbon with the brad, the wonderful tag, and of course the beautiful skaters!). Thank you for explaining how you made the ribbon and bow, it looks stunning! Your card is beautiful!!! Love every single detail!!! 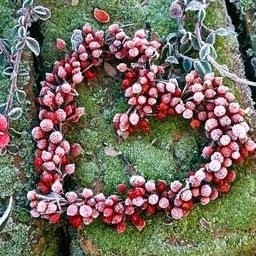 This is simply BEAUTIFUL Robin!!! I love everything about it!!! I also wanted to tell you THANK YOU for my awesome package in the mail!! You totally made my day when it arrived!!! You are the best and please know that is a small goodie heading your way too!!!! Love ya and miss ya!!! This card is fabulous! 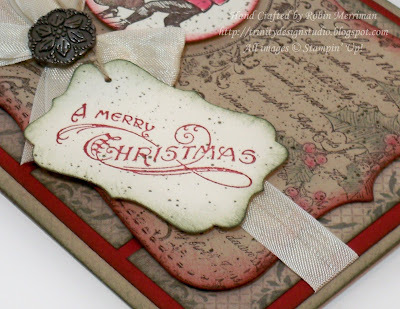 Great use of that stamp set and love all the texture. The top note die is one of my all time favorites and is perfect for holiday cards. GORGEOUS, Robin! 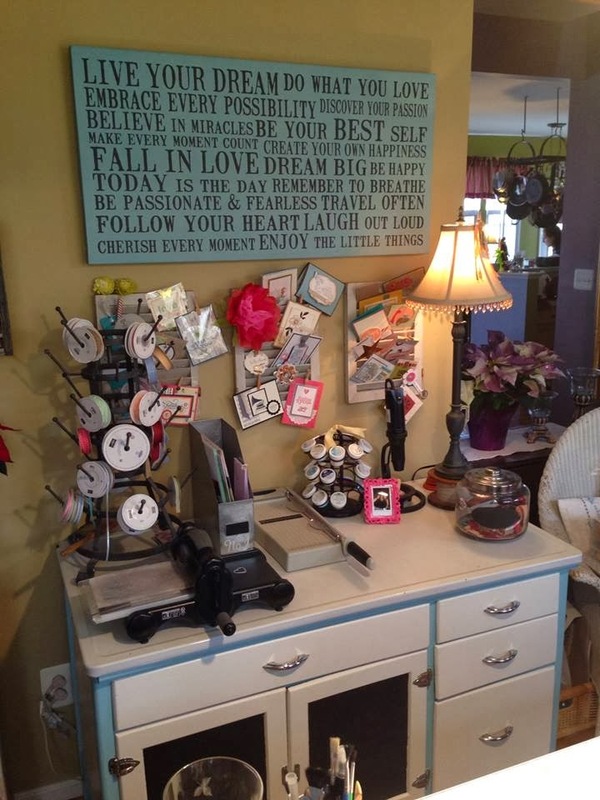 Love the ribbon and vintage brad... Your trip to the apple orchard sounds TOO yummy, too!